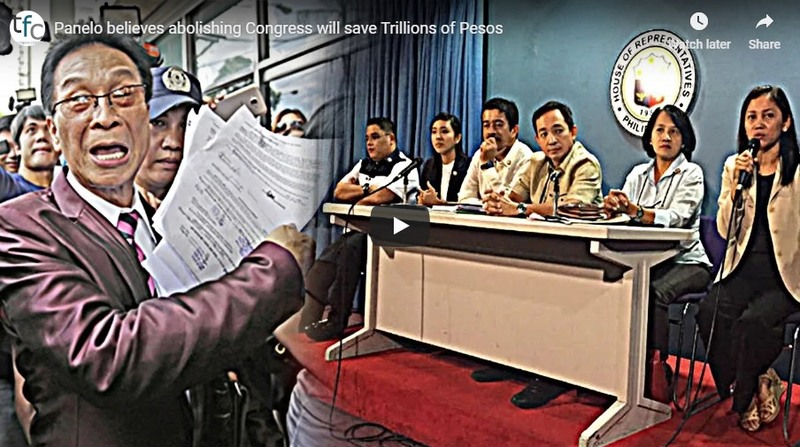 Presidential Spokesman Salvador Panelo revealed during a forum that he believes abolishing Congress will save Trillions of Pesos in government's money. He also stated that there's a possibility of "no election" in 2019. During a live social media forum initiated by Atty. Paula Knack and attended by some of the country's most influential social media personality, Spox Sal Panelo was asked by Atty. Knack the reasons why he will not run for an elective position in Congress or as a senator. As part of Atty. Sal Panelo's response, he narrated a story that happened 12 years ago in Makati City wherein he advocated for the abolishing of Congress and the institution of a Constitutional dictator. The reason why there's a need for abolishing Congress is the fact that the government will save trillions of pesos that can be used in various national government projects. For the past years, Atty. Panelo visited various parts of the country for his advocacy but nobody is worthy enough to become the Constitutional Dictator other than the Mayor of Davao City, Mayor Rody Duterte. Before Panelo revealed that Mayor Duterte is the person he is interested to lead the Constitutional Dictator, some of the names surfaced includes Sen. Ping Lacson, the late Sen. Miriam Defensor-Santiago, and former Pres. Gloria Macapagal-Arroyo. The Presidential Spokesman also made an interesting anecdote that despite the fact that there are so many politicians who run for various government positions, Spox Panelo stated that they just believe that an election will happen. Atty. Larry Gadon also agreed with the statement of Spokesman Sal Panelo to abolish Congress and he will support the government whether it will declare a Revolutionary Government or continue the election process.